Then step up for a more in-depth exploration of C-K theory by Hatchuel and Weil (2003). This reading will certainly get you thinking about designing for the unknown. These authors have also published real world examples of how this framework can be used to direct the design process. They discuss the process as used by the European Space Agency to assist the design strategy of a new combustion system using Martian CO2 (Hatchuel & Weil, 2004). I have summarised my engagement with these readings in the image at the top of this post; which is also housed on Flickr. 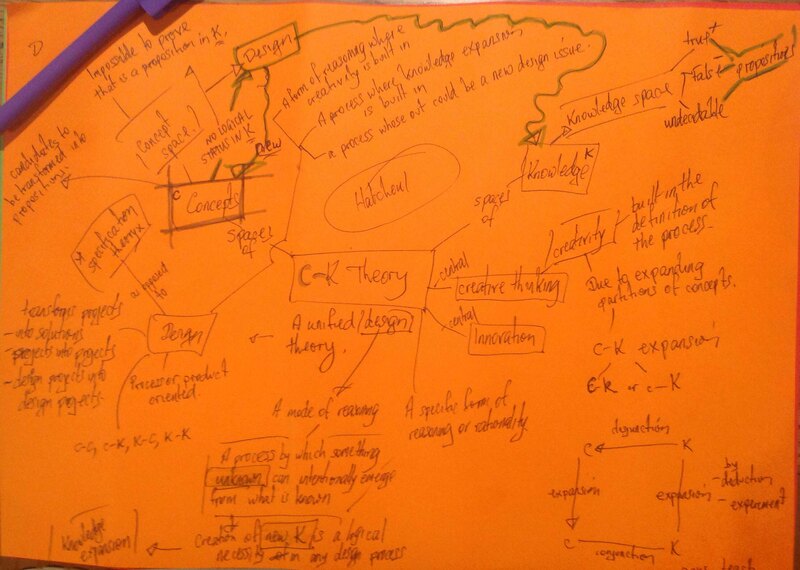 In summary C-K Theory is a design theory or mode of reasoning by which new knowledge and new insights can emerge. So, if we are aiming to design new learning spaces in schools, then by framing our explorations around C-K Theory we will hopefully learn something we did not know at the start of the journey. This is a highly creative approach to which innovation is central and within the context of designing learning spaces can assist the design thinker to seek the unknown. We have been playing with the idea that many design briefs for school development do not venture into this realm of exploration and innovation. What if all learning spaces, including classrooms, emerged via a design process that has creativity at its core and resulted in breakthrough solutions? What would the resulting learning spaces look like? Your comments and personal insights are welcome. The following design brief has been prepared for #INF536 following a series of observations recorded at a local health and fitness business. These are my observations and do not reflect the thoughts of the business observed. I find myself teaching in a school where to generalise the clientele, for a variety of reasons, are difficult to teach. This contrasts deeply to where I have spent parts of my career, particularly in the private education system or else even further removed from the coal face, while working as an educator in the Museum sector. This current work is rewarding but challenging. At present I am finding inspiration by reading “Change by Design” (Brown & Katz, 2011). These authors argue that the quality of insight is one of the key resources of design thinking. Where does this insight come from? It comes from connecting with the people we are observing at a fundamental level. Brown & Katz calls this ’empathy’ and declares it to be the most important distinction between academic thinking and design thinking. I am finding concepts of design thinking motivating in my teaching because the clientele I now teach think about and consume education quite differently than many other mainstream students that I have taught. Brown & Katz discuss working with the most extreme users and how such interactions may provide “opportunities for socially engaged design”. Very importantly the authors argue that non-designers can benefit from learning how to think like designers. I am learning that design thinking is highly relevant to educators such as myself and am discovering its relevance in seeking new ways to improve our classroom practice and systems of education. The following observations were made with the intent of identifying any design problems in the space being observed. With this in mind I made observations over a 45min period at my local gym Nu-Yu Health and Fitness at North Melbourne. Permission to do so was obtained by management before proceeding with this task. An image of part of the observed space is found on the Nu Yu website. I am intrigued by the paradox of innovation without change that I have discussed elsewhere. I am going to say quite provocatively that I face this paradox every day in the classroom. My students BYOD their devices and have knowledge at their fingertips and yet their engagement levels are low, in fact they are extremely low and I would argue that digital innovation has done very little to increase these students levels of interest in classroom based education. Perhaps the shiny BYOD devices that appear in these classrooms are a mere result of what Tim Brown (TedTalks, 2009) calls small design. Design as a tool of consumerism. Maybe significant changes in education are yet to come via the learning and application of design thinking whereby “something unknown can intentionally emerge from what is already known” (Hatchuel, 2004). As I will hint at below, in education, to an extent we are stuck between the old and the new. Perhaps the missing link is pedagogy and learning spaces revitalised by Design Thinking regardless of the tools that are used. I teach a middle school class (Level 8, as per the Australian Curriculum) in a traditional DEECD supplied relocatable classroom that is basically a square room with the whiteboard at the front of the class. The layout of this classroom is as depicted below (not to scale). These Government supplied classrooms can be problematic learning spaces, designed to perhaps sit students at desks, facing the front of the classroom, with the whiteboard being the main feature of the learning space. The physical layout of these rooms tend to encourage a very teacher-centred pedagogy. I would like to suggest they also encourage students to expect a very teacher-centred teaching and learning experience. I have been long intrigued about the call for student-centred learning and how these traditional classrooms we often teach in, in no way facilitate this. There exists a tension between traditional classrooms design and emerging pedagogies. As mentioned in the blog post “Design Thinking: A Human-Centred Approach” without realising it, there exists many biases in education towards the needs of the system. The traditional classroom design presented above might be one of these biases that indirectly dictates the way things happen in education, in this instance in the learning space being discussed. It is also important to note that my own work desk was situated in an office (labelled in red) adjoining this classroom. As explored by Tim Brown in the TED Talk referred to above, there is a need for a human centred approach to how people use products of design: in this context we might view the above classroom as a product of design. Karatko (2012) states that everything around us is an outcome of design. Tim Brown declares that the focus of design should be on humans and not institutions and starts with what people need or might need to make life more enjoyable or easier. He states that “It’s often about understanding culture and context before we even know where to start to have ideas”. Thus the spaces I currently teach in should ideally reflect local learning cultures and contexts. One important factor in this specific context is the ubiquitous use of technology within these spaces. The heavy use of technology could be considered as one way that challenges in space design in education has changed over recent decades. This is a big design question to ask: How should educators react to wide use of technology and indeed how should learning spaces be designed to facilitate the emersion of 21st Century Pedagogies; keeping in mind that as reported by Siemens (2008) “Current developments with technology and social software are significantly altering: (a) how learners access information and knowledge, and (b) how learners dialogue with the instructor and each other.” I am wondering if the presence of some BYOD devices is more symptomatic of small design ideas as apposed to the Big Ideas that Brown asks us to explore. The above classroom in question provides some physical constraint to modifying pedagogy. However, as mentioned by Kuratko (2012) the best designers use constraints as a source of inspiration and the best design is often carried out with quite severe constraints. Thus the space discussed should be explored with the mind set of a designer which are described by Kuratko as being: inspiration, proactivity, humility, flexibility and focus. Thinking about the above learning space the designer should observe, research and interact with the customer (student?) to see what they like and respond to positively (Kuratko, 2012). Tim Brown asks us to Think Big and exploit opposing ideas and opposing constraints to create new solutions. Importantly, he asks us to move towards the design of participatory systems. This is an important issue to reflect on in education as emerging pedagogies demand a participatory experience. The learning space that I teach in harks from a design era that viewed education as a passive activity where knowledge was given to student, as evidenced by the presence of the whiteboard. On that note, I wonder how teaching and student expectations would change if the whiteboard were taken out of this space? As also mentioned by Brown, in times of change we need new alternatives, new ideas, especially in the context of growing participatory experiences in education as facilitated by emerging technologies and ubiquitous use of social media. I am questioning if the presence of BYOD devices is more symptomatic of small design ideas as apposed to the Big Ideas that Brown asks us to explore. With the above ideas in mind I have been thinking about a small change I made to my classroom earlier this year. All I did was move my office desk into the classroom to the location indicated on the above diagram. I did this with a number of intentions. A) The primary intention was to build a sense of community of locating my personal working space in the classroom. B) The secondary reason was to create a working space in a ‘dead’ part of the classroom. C) I intended to also create space in the office as a ‘breakout’ area where I could send students to work independently. 1) Students choosing to use my desk as a learning space. 2) Students sitting under the desk to work independently. 3) Students sitting in pairs in the safe space between the desk and the wall. 4) Students clamouring to work in the office area away from the rest of the class. Management also asked why my desk was in the classroom and I had to have a conversation to pacify their fear of me sitting at the desk during teaching time. So, this one small change initiated a string of emotional and behavioural changes and is perhaps a simple reminder that design thinking depends upon observing how people actually use products of the design process, including contemporary learning spaces. Instead of starting with technology perhaps we should start with people and culture (TedTalks, 2009). Hatchuel, A., Le Masson, P., & Weil, B. (2004). CK theory in practice: lessons from industrial applications. In DS 32: Proceedings of DESIGN 2004, the 8th International Design Conference, Dubrovnik, Croatia. Kuratko, D., Goldsworthy, M., & Hornsby, G. (2012). Effective innovation plans in Innovation acceleration : transforming organizational thinking. (pp. 265-273). Boston: Pearson.